It's The Michael Strahan Show! I was just thinking the other day that primetime television needs more shows featuring NFL sack leaders in key acting roles. And look at that! It happened. Michael Strahan is the newest member of the Fox family. 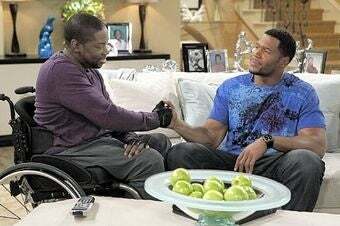 The network announced that they have picked up Brothers, a sitcom slated for next fall's schedule, starring Strahan as (stretch!) a former NFL player who moves in with his parents and Daryl "Chill" Mitchell. (Oh, I guess he's the brother.) It seems his Subway commercials and Emmy-worthy guest spot on Chuck was all it took for the network of Family Guy to cut the check. We are a very lucky country. Brothers will join a long list of phenomenal award-winning television shows starring and/or about former big time athletes, like Hanging With Mr. Cooper, NCIS, Evening Shade, Mr. Belvedere, The Six-Million Dollar Man, Spencer: For Hire, Magnum, P.I., and that episode of Diff'rent Strokes where Ed "Too Tall" Jones was afraid of heights. (My memory may be a little fuzzy on some of those.) No word yet on whether Jay Glazer will play the wacky, ex-sportswriter neighbor with boundary issues.